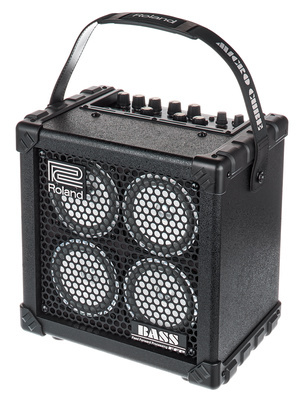 Roland Micro Cube Bass RX Bass Combo - 2x 2.5W (stereo), 4x 4" speakers, JC-120 chorus, stereo reverb, stereo line/headphone output, 6x amp models (Ampeg B-15 combo, Fender Bassman, Trace Elliot stack, Acoustic 360, SWR stack and Ampeg stack), mic preamp, 7x DSP effects, tuner, 3-band EQ, 'Rhythm Guide' drum machine with 11 styles (metronome, rock 1, rock 2, blues, country, R&B, ballad, jazz, funk, Latin, dance), start/stop and volume controls, double footswitch connector ('Rhythm Guide' start/stop & tap tempo). Powered via 6x AA batteries (optional) for up to 13hrs use or power supply (included). Includes strap. Dimensions: 30 x 30 x 21cm. Weight: 6.4kg.